The MF Gun series are very similar to the MS Gun series. The only difference is the integration of a filter screen within the manifold of the gun. The MF Guns are “air open and spring closed” and use the H-200 style gun module. These applicators should be used with general packaging grade adhesive at temperatures from 93°C(200°F) up to 190°C(375°F). These guns are compatible with Nordson BCS Classic Blue and Solid Blue A gun series as well as the older H-200 series. The MF Guns can be configured in various spacing configurations and have 3 available fluid ports on each gun to allow for maximum versatility when installing on the production machine. Each MF Gun is configured with a 220-240VAC heater cartridge. The wattages vary depending on the size of each manifold. The standard heater OD is ½”. The MF Guns come standard with a clamp for ½” round bar or hex bar stock. There are 3/8”round bar bracket clamps available and can be purchased separately. If additional brackets are required, please see the brackets section of the Valco Melton catalog. They require compressed air at a pressure of at least 60PSI to lift the needle off of the seat which allows the adhesive to flow through the valve and onto the product. Gun configurations having 4 or more modules will require greater a higher volume of air as well as a higher pressure base no less than 80PSI. For any applicator with more than 4 modules, it’s recommended that 3/8” or 10mm air line is used to supply the compressed air. All air ports are 1/8” NPT. 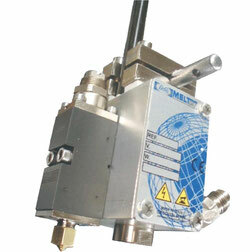 The MF Guns also offer various activation configurations for independent air porting. Most independent air configurations are fitted with QD fittings to allow for easy installation. The filter screen used in the MF Gun series is the same screen used in the MARS In-Line Filter assemblies. It’s an filter cartridge that can be easily changed without removing the hose or gun from it’s mounted location. A wrench or socket is all that is required to remove the filter screen. There are 3 sizes of available filter screens. The standard MF Guns come with a 100 screen mesh filter. 50 mesh and 200 mesh filter screens can be purchased separately. The MX electric valve is fired from a special control or valve driver. This driver can be purchased as a separate individual box that receives a 24VDC signal from a PLC or other controller and outputs a signal to the MX. If you are using or have the Valco MCS, MCP-4, VCX, or MCP-25 control this driver is already built into the software and can be operated without the use of the external driver.